This image shows a young stellar grouping in one of the largest known star formation regions of the Large Magellanic Cloud, a dwarf satellite galaxy of the Milky Way. The picturesque view was captured by the Hubble Space Telescope's Wide Field Planetary Camera 2. A busy cosmic landscape of bright stars against a dust-filled, hazy background is the focus of a newly released image from the Hubble Space Telescope. NASA featured the photo on its website today (April 24) just in time for the prolific observatory's 22nd birthday. The Hubble Space Telescope launched into orbit aboard the space shuttle Discovery on April 24, 1990. 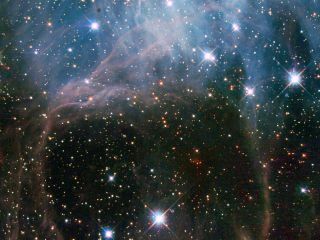 The incredibly luminous stars are part of a young stellar grouping in one of the largest known star-forming regions in the Large Magellanic Cloud, a neighboring dwarf galaxy of our own Milky Way. The stellar grouping, known as NGC 2040 or LH 88, is a loose cluster of stars that have a common origin and are drifting together through space, according to NASA officials. Stellar associations are identified based on the properties of the stars contained within. NGC 2040 is a so-called OB association because it holds 10 to 100 stars that are type O and B, which have high masses but live short and dynamic lives. According to NASA officials, it is thought that most of the stars in the Milky Way galaxy were born in OB stellar groupings. The image was taken by the Hubble Space Telescope's Wide Field Planetary Camera 2. A version of the photo was entered into a constest, called Hubble's Hidden Treasures, which invited astronomy enthusiasts to comb through the observatory's archives for spectacular images that have never been seen by the general public. Last week, Hubble's science team also released a giant mosaic of a region of intense star formation in the Tarantula nebula known as 30 Doradus. The spectacular Tarantula nebula photo is the largest mosaic ever built from Hubble images and is the space telescope's official 22nd birthday photo. The Hubble Space Telescope is a joint effort between NASA and the European Space Agency. In the 22 years since it was launched, Hubble has revolutionized humanity's understanding of the cosmos. Among its myriad discoveries, Hubble revealed that the universe is expanding at an accelerated pace, which led astronomers to theories of mysterious "dark energy" in the universe that could be causing this acceleration. Hubble has been repaired five times over the course of its long career, but it is expected to remain operations until at least 2014.